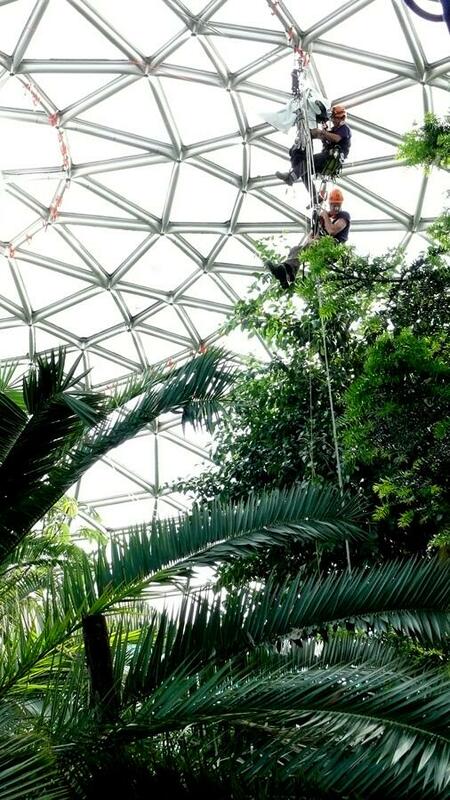 The Bloedel Conservatory Has a New Roof!! Bird’s eye view of Vancouver from atop the Bloedel Conservatory. 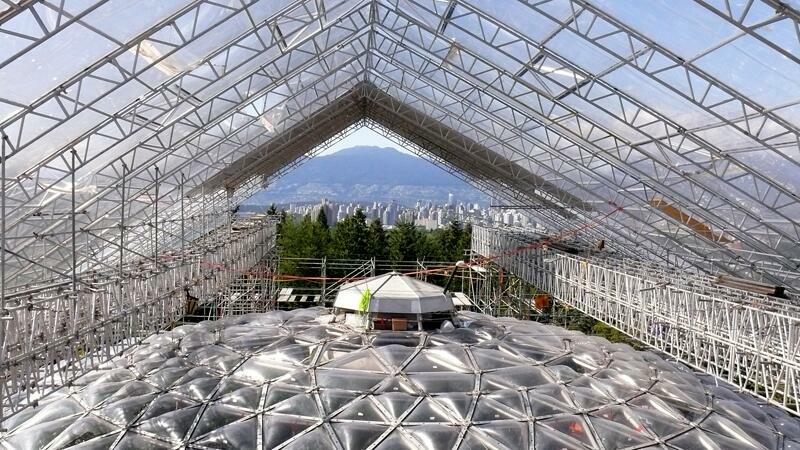 Six months after the intricate and impressive scaffolding was installed by WestCan over the dome, all 1,490 plexiglass panels have been successfully replaced and the Bloedel Conservatory has a new roof! This scaffolding was unique in many ways: it could not touch the dome at any point, and transparent, protective plastic sheets needed to be stretched up and over the top to keep workers, birds, plants and visitors dry while the plexi bubbles were being replaced. Watch a special time lapsed video here. Rope access technicians worked through the wee hours of the night whenever specialized interior netting needed to be installed or moved. This netting kept debris from falling into the dome and nearly 200 free flying birds from finding their way out. Rope crews getting ready to hang netting inside the dome. Thanks to the fantastic teams at Spectrum Skyworks and Pacific Ropes, not to mention a specialized Hazmat crew, this massive project was completed a full 2 months ahead of schedule! Special kudos also go out to the onsite Bloedel staff who managed to keep the Conservatory open, running smoothly and looking spectacular while this substantial project was underway. Originally planned as a 3 phase project, we are so fortunate that the City of Vancouver, the Vancouver Board of Parks and Recreation, the Federal Government and Prentice Bloedel’s Daughter, Virginia Bloedel Wright, came together with $2.4 million dollars in funding to complete the entire roof project in one phase. All 2,324 pieces of extruded aluminum tubing that make up the triodetic dome have been polished and the scaffolding has started to be dismantled. 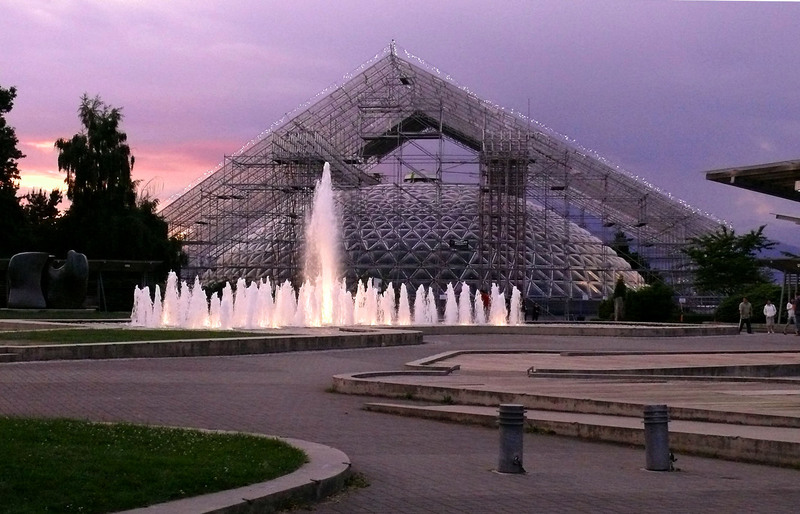 The Bloedel Conservatory has been restored to its former glory and brilliance! And mark your calendars! The “We Did It! Bubble Bash”, a fantastic roof completion celebration party is scheduled for Thursday, September 25th. Stay tuned for more info! It’s an event not to be missed!